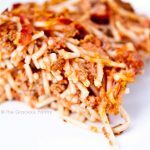 Have you ever tried a clean eating spaghetti pie? I promise, it’ll be a hit at the dinner table! The Italian dinner table is the epicenter of everything that happens in the lives of the people who sit at it. And typically, you do just that. Italian meals are an experience unto themselves. There is a whole world of excitement, emotion, and hands waving passionately in the air with every word. You come away from a meal feeling as though you’ve experienced a lifetime of emotion in one evening’s dinner. You feel a strong sense of family and contentedness. It’s a fabulous experience. I highly recommend it. The Italian kitchen is also worth a visit. Buzzing with chit-chat and steamy from large, bubbling pots on the stove, you enter into a world of strong opinions, excess amounts of advice, and usually more food than you can handle. Often, that food includes a nice big plate of spaghetti. I will never get tired of spaghetti. Since I was little, it’s been one of my favorite dishes. A go-to comfort dish that seems to drown all my troubles in warm, tangy, basily, saucey goodness. That said, every once in a while, I like to “mix it up” a little. Try something different with a traditional recipe. And Spaghetti Pie was definitely a new phenomenon for me. While it’s definitely easier just to make a pot of spaghetti, this dish makes for a nice change when the same ol’, same ol’ gets… well…. old! So pull up a chair and Mangia!!! Nobody can pass up a delicious pan of spaghetti pie. Serve with a green salad and you've got a full meal! Crack your eggs in a medium-sized mixing bowl and whisk slightly with a fork. Combine all ingredients (except the parmesan) in a large mixing bowl, and stir until the egg is well-distributed. Transfer to a 9x13 baking dish. If using the parmesan, sprinkle over the top of the spaghetti pie. Bake 50-60 minutes. There should be no liquid (egg white) visible when you cut into the middle of it. This recipe from the Gracious Pantry archives. Recipe originally posted on 1/12/11. Love the sound of this one! I need some GF spaghetti noodles and then I’ll have everything I need for it. I can’t wait to try this! Paulissa – Yes! GF noodles would work perfectly! Enjoy! Trude – Fabulous! I look forward to your feedback! Hooray! I grew up eating lots of spaghetti (my mom is half Italian), so I do get tired of it. My husband, on the other hand, is so pleased when I serve him a big plate of noodles. This dish seems so perfect for the two of us! Sarah – Wonderful! I grew up with a lot of spaghetti myself. But I never get tired of it. It’s one of my all-time favorite meals! I’m a newbie. Can you tell what brand is “jar clean spaghetti sauce” ? Thanks!!! Robin – I don’t know what stores you have in your area, but usually it takes a little label reading to find one that’s clean. There should be absolutely no added sugar (in the ingredients, not in grams – there is natural sugar in tomatoes, that is fine), and you should recognize every single ingredient as something you would cook with in your own kitchen. I buy mine at Trader Joe’s. Whole Foods also has several. A health food store is typically your best bet. Hope this helps! Rao’s Marinara Sauce is my favorite no sugar added …the ingredients are just what you would use if making it yourself…which I could do but sometimes it is nice to just pull that out of the pantry! It isn’t available in most grocery stores…not specialty stores like Whole Foods. That should have said It IS available in most stores! Judi – Yes!! They have wonderful sauce! A bit pricey here in my area, but on occasion, totally worth it. can’t wait to try this. I make my own spaghetti sauce, and it’s pretty clean. i changed the sugar to agave, and you can’t tell the difference!! I can share it if anyone is interested. Lisa – Feel free! More recipes are a good thing around here! Forgive me, some of the things I just guess on. Has anyone tried making this without the parmesan? My daughter is allergic to all dairy and I have been looking for a way to change up some of our go-to dinners. Jennifer – Yes! The one pictures above is without any dairy (parmesan). I can’t have dairy any longer, so all my current recipes for the past few months are dairy free, including this one. Hi! I love your site, and this sounds great. Do I need to cover this with foil while baking? I’m new at cooking clean. Thanks. Elisha – No. Not unless the top starts to get to brown for your liking. It is just me and my husband and I was wondering if this is freezable. Jennifer – It would probably freeze okay, but it would most likely be better if you just cut the recipe in half. If you leave the pasta just shy of cooked when you freeze it, it’ll finish cooking when you heat it and turn out as if it’s freshly made. Jaime – Great tip!! Thanks! Love your website and all the wonderful information and recipes! Do you actually use a regular size pie dish to bake this recipe? Jen – I used a 9×13 lasagna pan. Works like a charm! Jen – You’re welcome! Enjoy it! Cara – If you enjoy the process, it will! You can do it!! Do you think that it might be possible to use spaghetti squash with this? Mandy – It actually might work! It’s worth a try! Andrea – Awwwe, thank you! I appreciate you taking the time to comment. 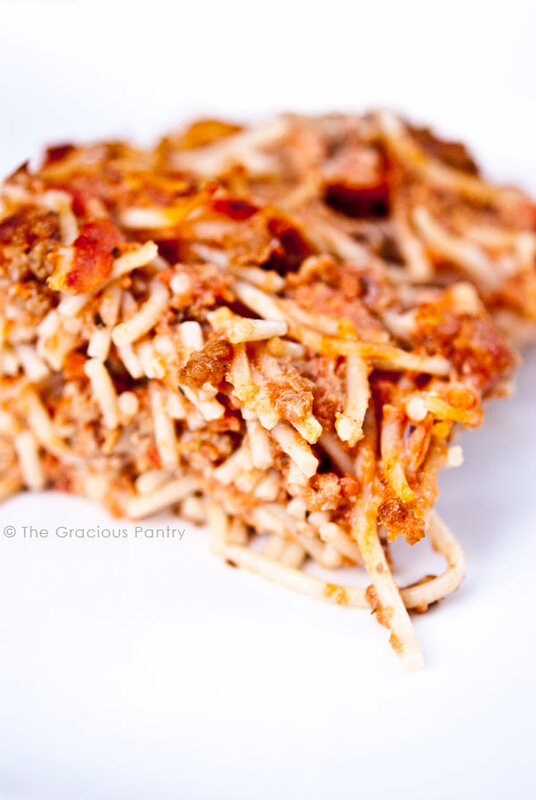 Alilgranola – Did you cook the pasta before making the spaghetti pie? It’s not supposed to be raw. The eggs are what binds the pasta, so if you feel you need more, add another 1 or 2 to get the proper amount of binding. Hope that helps! Christine – Sure! That should work fine! Anybody use a different type of noodle? I see. I would think most types of pasta would work for this. Will this work without meat? I eat fish (and bacon, though I know it’s not clean) occasionally. But not other meats. Dr C – Should be fine. Thanks for this great site. I made this recipe with Brown Rice Spaghetti and it came out mushy. Was it the spaghetti or did I do something else wrong? (I’ve never used rice pasta before). Thanks! Yes, rice pasta is mushy. Sorry about that. I hope it at least tasted good! Can you use gluten free pasta for this recipe? I’ve never used it, but I would have to say that as long as it doesn’t get too mushy with cooking, it should work just fine. I made this for dinner tonight with 16 oz. shirataki noodles instead of the pasta and it turned out great and saved lots of calories!! Thank you for the recipe! Cherrie – Interesting! I don’t think I’ve ever had those. Glad it turned out well! Hi, we’re just starting on the clean eating diet…random question…what do you do with all those egg yolks?? Patricia – You can save them for other recipes, or you can use half the number of eggs, but use the whole egg. Can I make this ahead of time? Just like a few hours?? Made this over our snow in days.. LOVED it!!! Thanks so much for the awesome recipes!! How many calories are in a serving? From my end, I cannot see the nutritional information. Cheyenna – I don’t have it for that recipe. It will vary based on the sauce used. Can you use liquid egg whites? Would it still be 8? Danielle – I don’t use them, but you could. Though I have no idea how much that would measure out too. I’m sure the manufacturer’s website would say something about that. Worth a shot! I was really excited to try this recipe because my son is allergic to dairy. Are we supposed to cover it while it bakes because I only cooked it for 40 minutes and it was crispy on top. Also I didn’t think it had enough sauce. It seemed kind and dry inside. I want to try this recipe again but will add more sauce and cover it next time. Tanya – Ya, I’m thinking that the amount of sauce needed might vary slightly by the pasta you use. You absolutely can cover it while it bakes, but I didn’t because I like the crispy top. Just a personal preference. Glad it might work for you though!